A time to celebrate the life of Betty L Thomas, 78, a resident of Davenport, will be held from 5:00 until 7:00 p.m., Friday, September 4, 2015, at the Halligan McCabe DeVries Funeral Home, downtown Davenport. Keeping with her wishes, cremation rites have been accorded. Memorials may be made to Holy Cross Lutheran church or the Quad City Animal Welfare Center. 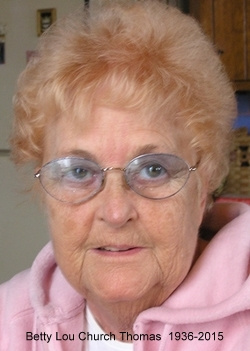 Betty Lou Church was born on October 30, 1936, a daughter of Everett and Mabel (Warnke) Church. She was born in Monroe, Nebraska, and raised in Prophetstown, Illinois. She was united in marriage to Ronald Thomas on June 11, 1965, in Philadelphia, Pa. This past June, they celebrated their 50th anniversary. Betty was primarily a homemaker, but for a brief time worked at Central High School as a baker and a cashier at local drug stores. She also volunteered at both Genesis Medical Center campuses with the "Pink Ladies." Betty was an avid bowler, a member of the Davenport-Bettendorf Bowling Association Hall of Fame and a longtime member of the board of directors, and a member of the Women's International Bowling Congress. She enjoyed traveling to see her children and grandchildren and took many winter trips to the Caribbean with her husband, Ron. She was a great fan of the Chicago Cubs and endured the ups and downs that go along with that. She enjoyed most of all anytime she was with her family. Betty is survived by her husband, Ron, Davenport; children: Alan (Julie) Wagner, Colonial Heights, Va., Brenda (Steve) Carter, Cedar Rapids, Iowa, and Leah (Chris) Smith-Thomas, Chanhassen, Minn,; grandchildren, Jessica (Mike) Carter, Dani Carter, Justine Wagner, and Olivia Smith-Thomas; a brother, Jim Church, Lyndon, Ill. and many nieces and nephews.